Is the head mounted there ontop of a 750 or long stroke (taller) barrel? Im wondering as I think a single carb head will have the carb sat more square and possibly a touch lower??? Very nice looking set up. its a short barrel. Big bore 732 for B44 pistons, JH was checking clearance around carbs. This was probably explained in another thread, but can someone describe the drive mechanism of the starter? John can correct me when I am wrong. 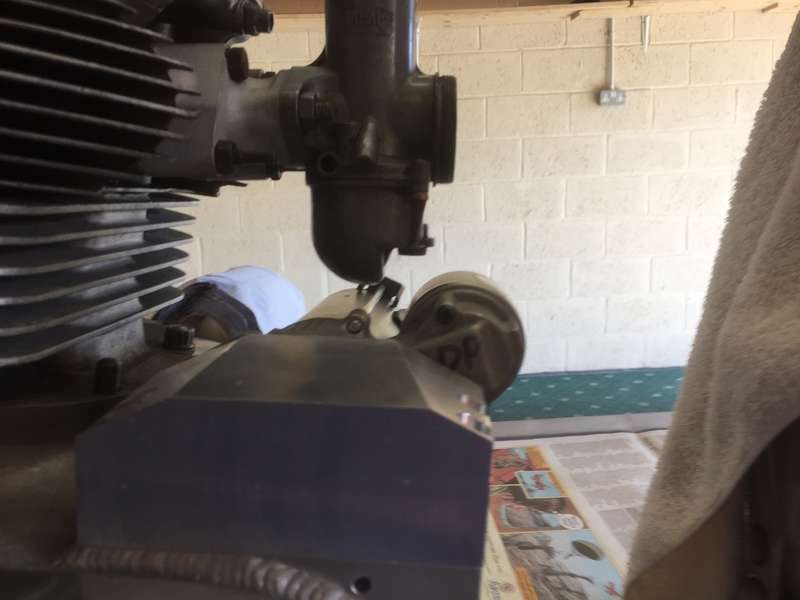 Its a starter motor with a Bendix, this throws out a gear to engage on a large gear around the clutch drum which is a triplex basket with the inner row of teeth machined off and a starter ring pressed on. 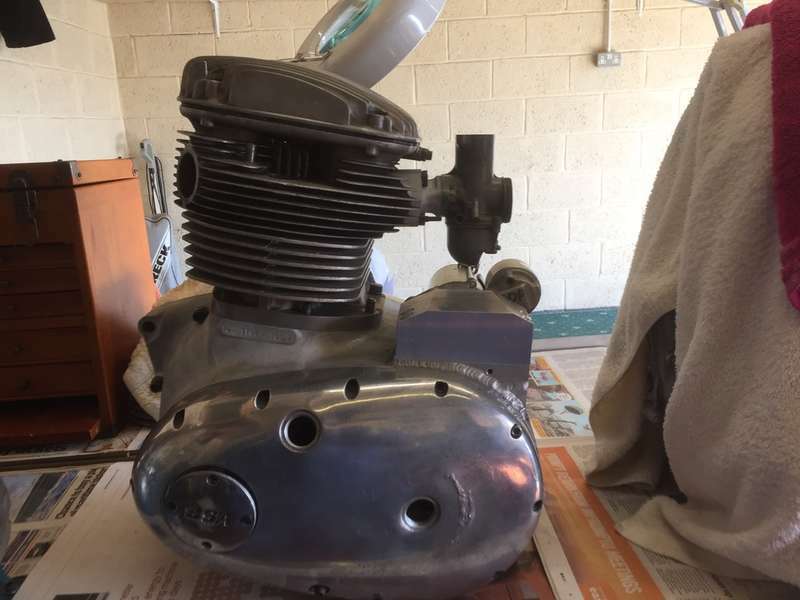 I think the starter is the same used on HDs, could be wrong we talked about this a while back , might be off a Bee Em,same idea anyway, much like a Sportster XLH model in principal. These are fairly backfire proof compared with some systems. The earlier thread has pictures of the inside. 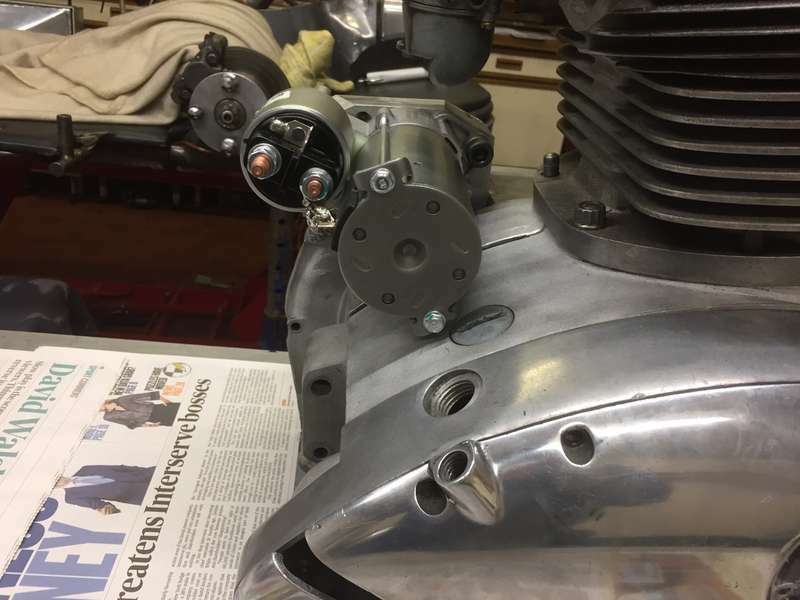 This has kept John thinking and welding , the chaincase was cut open and a large flange welded on after the whole side was supported with a temp steel plate to minimise distortion. The whole lump is a collection of items that needed repair, the motor mounts were savaged, the cases are not matched , the outer TS has been cut for clutch access ,, head is an early small port, not sure if John has any guts for it yet, will probably get an end feed and case alignectomy, very much a test bed proof of concept. The barrels look extra long because the head is missing the bottom fin. It all looks good from here and very interested to hear of its progress also. If you can get it to work then the Bendix is the best way, otherwise you are relying on a sprag clutch. They take up room and are not reliable, they end up either slipping, seizing or destroyed by backfiring. They also restrict you to motorcycle starters which are low in power, max is around 1.1kw. You can get away with the lower power by gearing but this adds to the complexity, being able to use a Car type starter gives you the option to go to 2kw. You can get the Duplex Laverda chain from 'Andy the Chainman' (who is no longer Andy) and that gives the room for the drive gear on the clutch. Sprags are a right royal pain even when stopping the engine, the pistons bounce off compression and rotate the crank backwards, the sprag engages stressing the starter drive train. You cannot bump start because you cannot pull the bike back onto compression. John put me straight on stuff today, its a BMW motor unit, there is an idler gear to fill the space between the starter ring and the bendix gear. The idler gear is in constant mesh with the starter ring, only driven by the motor when the Bendix throws out. 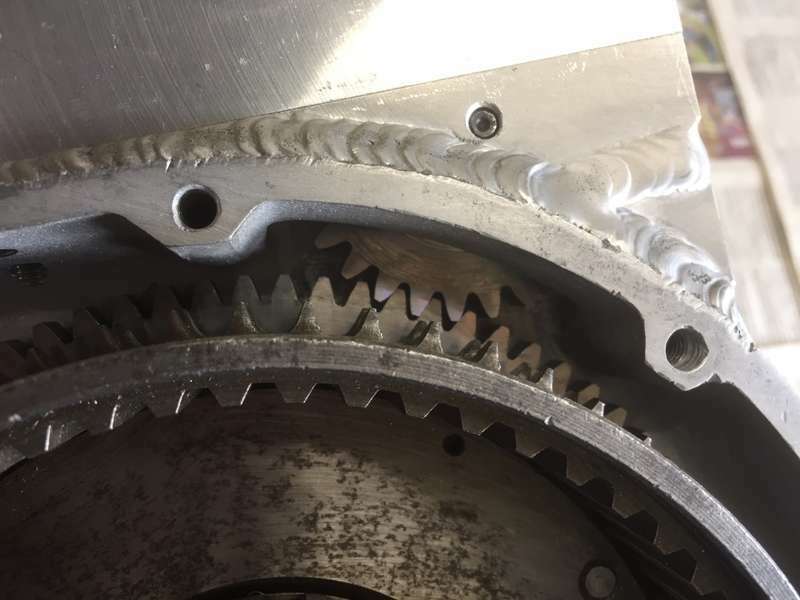 There is a gear housing with idler gear carved out of alloy uniting the flange and the motor . 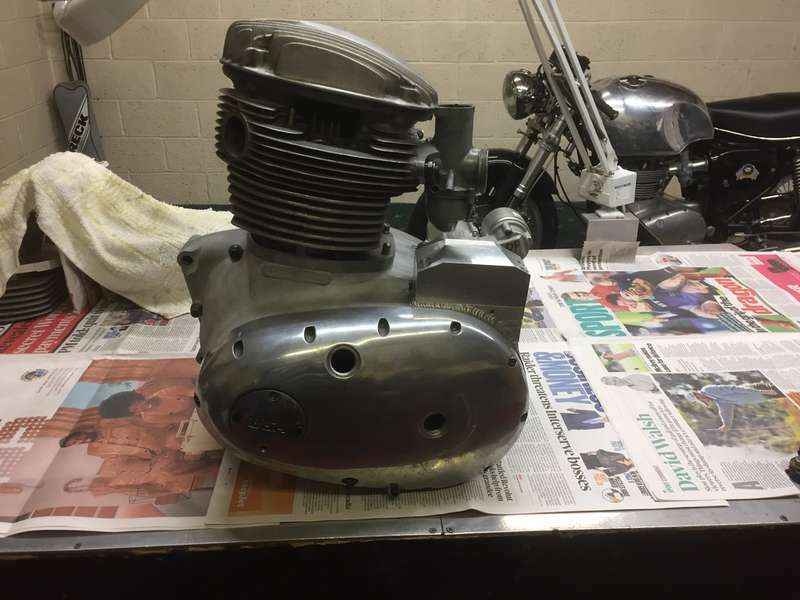 John tried an HD lump but it was too lumpy, He also test fitted a single carb head, and had reasonable clearance at the carb banjos. He reckons it could be done without an idler, but , much larger case surgery to clear the motor bulk would be needed. Pics of tbolt head and starter ring with intermediate gear. That appears to be a Norton clutch basket. Presumably John used the whole hub and bearing arrangement to keep the basket from wobbling about when the pressure plate is lifted? From the look of the idler to ring gear diameters, the idler runs about 1.25 times the crank speed? I think the reason manufacturers go to sprag starter drive is they do not need a throwout solenoid and linkage. David: Yes a Commando clutch and reason is as you presumed. Ring gear OD 187mm, Idler gear OD 62mm. Andy: In total agreement with your views on a sprag clutch arrangement. Kommando: In agreement with your comments. 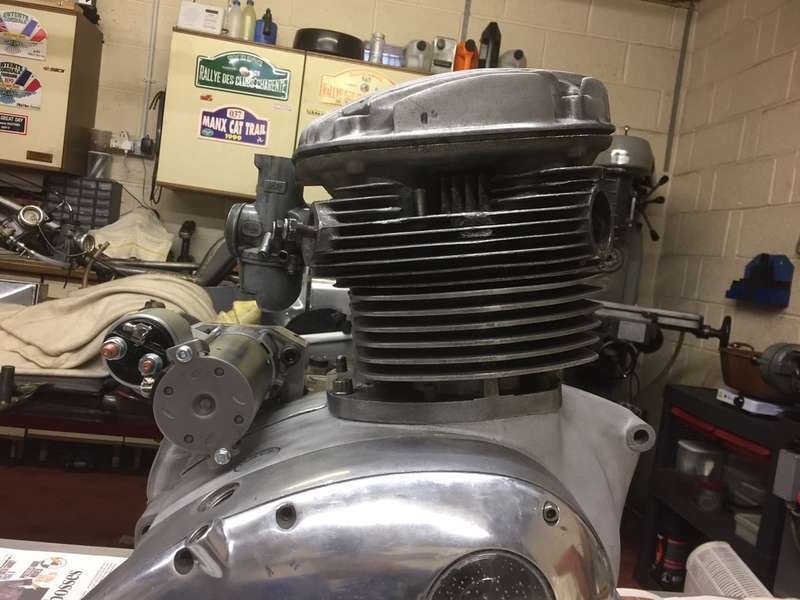 Allan: The T/bolt head is sitting on 750 barrel with no gaskets, a 650 or long stroke barrel with gaskets would lift the carb approximately 10mm. I haven't considered a Newby clutch. 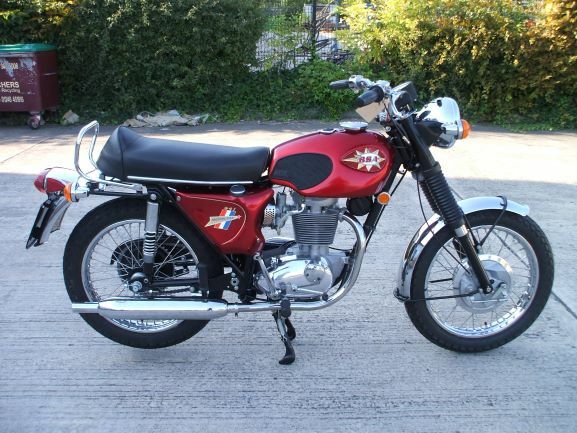 I have one on the outfit and shall give it a quick look and let you know, but from memory the Newby sits further back in the primary case that the BSA/Norton clutch. Last edited by JER.Hill; 03/27/19 8:22 am. A couple more questions if I may, I’m assuming that if anyone would like this they would need to send both crank cases and gearbox cassette and clutch basket to you? The other is, will you be providing a cover for the solenoid/bendix(?) and starter motor? Just thinking of any fuel from the carb being tickled may drip in that direction? 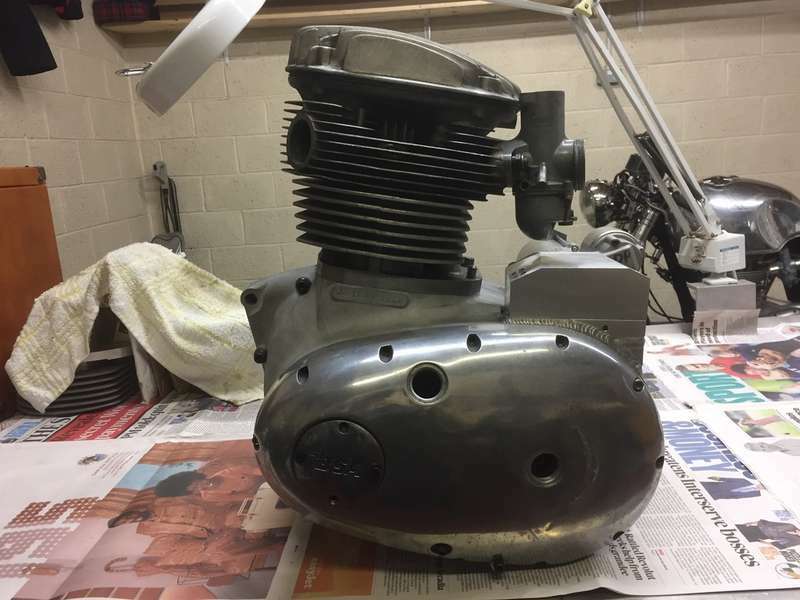 Which ever way I’m quite excited about this project and would like this on the 823 motor. I too am very interested in this project John.. Many thanks for taking the time and effort to come up with a leckky boot! !